Nice bellt buckle marked Alpaca Mexico. 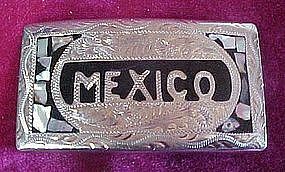 Fancy Western design engraving and the word MEXICO. Embellished with abalone chips. Measures 1 5/8" x 3". Excellent condition. Not sure, but looks like if the front layer is real silver, but not sure.